Discover what is important to your staff (great wines, live music, seated or buffet dinner) and plan accordingly. Ensure that you have a list of possible dates when the MD and other senior staff can attend before starting your search. How do I convince others that a Christmas Party is worth holding if budgets are tight? When budgets are being squeezed, this is can be an understandable issue for many companies. However, assuming a cost per person of say £100 and an average salary of £30,000, then the party will only represent 0.3% of the company's salary bill and many would see a relatively small investment in your people’s team spirit and morale as excellent value! Most companies use this opportunity for the Directors to address the staff and/or hand out annual achievement. This will further enhance the value the event, as it is a rare opportunity to address to the whole company with warm and positive messages. Do I choose a Shared or Exclusive Party? If you are a group of under 100 guests then you will often get a better party for your money if you join in with other companies on a Shared London Christmas Party Night (sometimes referred to as a ìJoiner Christmas partyî). These nights are sold on a table basis with minimum bookings of just ten (sometimes eight) guests, so the perfect choice for department of small company parties. You will be mixed up with other groups during the reception, but your tables will be together for dinner and in most cases the atmosphere and entertainment will be bigger and better! If you are over 100 guests, you will be able to find good exclusive Christmas party venues for similar prices and, as long as the venue isn’t too large for your group (best to check the maximum numbers it can hold as a guide) then you will get a great atmosphere going with 80 or more guests in the room. How do I make sure my proposed venue or organiser will give me a great party? Always shop around and check the financial strength of the supplier/venue before contracting. Try to speak to at least three clients who were at the same venue last year. If they can’t supply these, then beware! Don’t pay a large deposit to book. 40% should be the maximum and never book without visiting the venue first, since anyone can have an attractive website using other companies images! 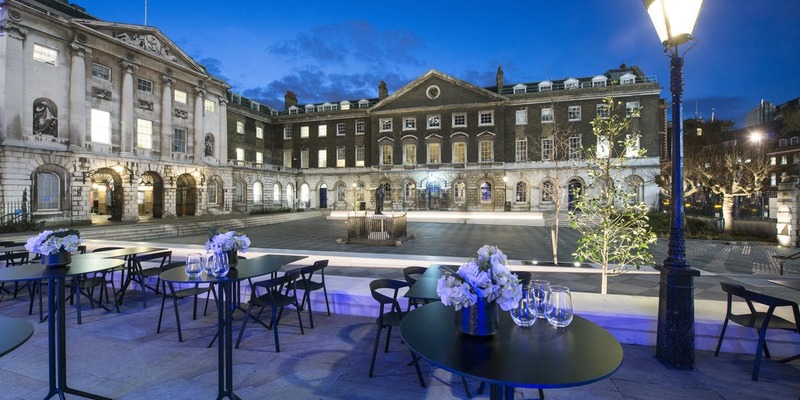 How do I get best value when booking my London Christmas Party venue? The best way to achieve this is, without doubt, to book into a party season at an established venue. This will deliver amazing lighting and decoration at a fraction of the bespoke price and allow you to retain catering and entertainment content within a tight budget. If you are prepared to take a Monday/Tuesday date, it will cost you 20% less than a prime date. You can also get better prices per head if you book close to the maximum capacity, so find a venue that is the right size for your party. Make sure the basics are in place to ensure that you give a great first impression, followed by good food and a great DJ/dancefloor. Everything else is not essential to a great party and should be viewed as ìnice-to-havesî if you are on a tight budget. Ensure that you have a clear policy on traveling home. An unlimited taxi policy can lead to a large and unwanted bill in January. Venues close to stations and a midnight finish, or a set “Get Home” allowance will help to reduce these costs and encourage sharing of taxis etc. We hope these ideas and guidelines will help you plan the perfect London Christmas party. Alternatively simply give us a call on 0207 870 9305 or email us your requirements and leave your venue finding to the experts!